Name tags are often used in classroom and camp settings for kids. The name tags help both the teachers and other kids remember names, particularly in the first few days of meeting. Instead of the boring "Hello, my name is..." sticky name tags, turn the task into a creative project that involves the kids. Many everyday items are easy to transform into creative name tags. Turn the kids into rock stars with mock backstage passes as name tags. This name tag idea works particularly well for music class or a music camp but can be used for any situation. Each child gets a rectangle of card stock. Let the kids decorate the cards to create the backstage passes, including their names in large letters. You can also preprint the backstage passes and let the kids decorate around the words. When they're done, you can laminate the backstage passes or place them in a clear plastic name tag pouch and attach the cards to a lanyard or length of string so the kids can wear them around their necks. Create collage name tags using the letters from magazines. The kids search through old magazines to find each letter in their names. Encourage them to choose large letters in different fonts and colors to create a contrasting look. The kids then glue the letters to a rectangle of card stock. Adults can laminate the cards and attach a name tag pin backer to them. You can also punch a hole in the cards and tie them to a string if you want the kids to wear them around their necks. Save the lids from frozen juice containers to create round name tags for kids. The kids can paint the lids or cover them with felt. If you use a felt covering, provide the kids with paint pens or fabric paint so they can write their names and decorate the felt. You can attach a pin back to the lids or hot glue a length of string to the back to create a name tag necklace. The juice can lids are durable, making them a good name tag option. This name tag idea works best for older kids. 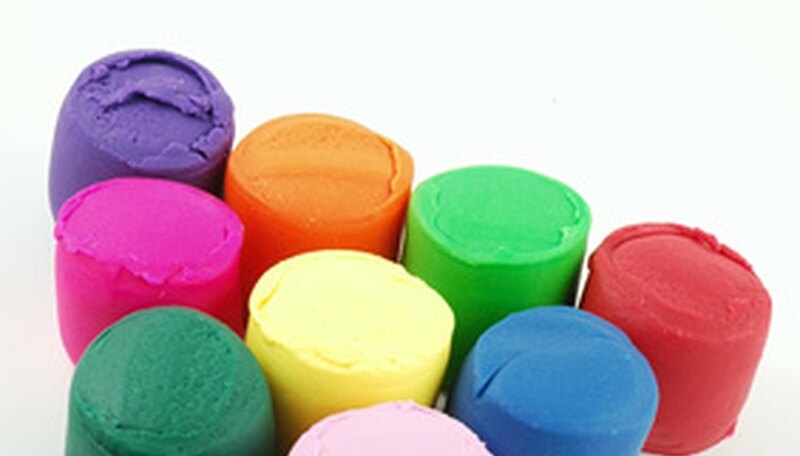 Start by giving each child clay or self-hardening play dough. The kids roll the clay into long snakes and manipulate the snakes into the letters of their names. Let the letters harden before painting them. Glue the letters onto a piece of painted cardboard or other sturdy material, and add a pin back to the cardboard to turn it into a name tag. This simple name tag idea lets the kids stamp their names and other shapes. Each child needs a rectangle of card stock. Provide letter stamps so the kids can stamp their names on the card stock. Let them use other shaped stampers or stickers to add embellishments to the name tags. You can laminate the tags before adding the pin backer to it. You can also use plain sticky name tags with the stamping idea for a temporary name tag.